Sherlock Holmes season 4 was finally released! You can now watch Sherlock new episodes online and in HD in any country (US, Canada, Australia, India, Spain, anywhere in the world)! Read our article to learn how to watch Sherlock season 4 online – in or outside the UK. BBC iPlayer it’s a free and legal HD streaming service that allows you to watch live UK TV channels and catch up on TV programs that you missed. And btw, there’s no commercial advertising! On your laptop – access the BBC iPlayer website http://www.bbc.co.uk/iplayer on your web browser. Sherlock is a BBC One exclusive series and BBC One is an UK-based channel. If you try to use BBC iPlayer outside UK you will get the error “BBC iPlayer only works in the UK”. 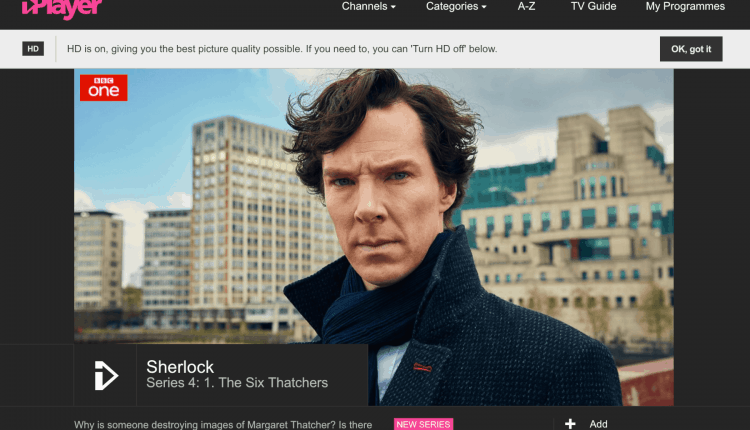 So, how can you use iPlayer outside UK? It’s not hard to do it, actually you just need a VPN. If you subscribe a VPN like IPVanish, and install it in your device (Windows, Mac, Android or iOS), you will be able to select a country from a huge list of countries available. When you select a country on IPVanish, you will be hiding your IP and getting a new IP from the country selected. For e.g. 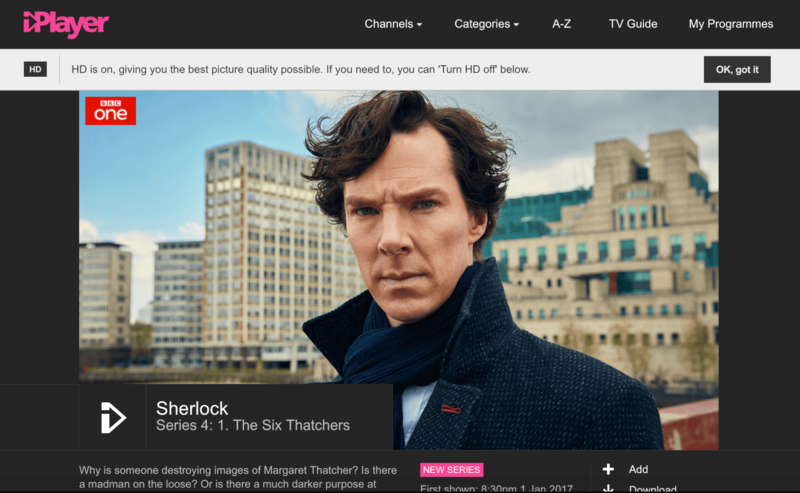 to use iPlayer you would select UK from the IPVanish list and then click in the connect button. You will get an UK IP address so you can use any UK service, including BBC iPlayer. So, just 2 simple steps: 1- Open IPVanish App or software; 2- Select a country to connect. So easy! I recommend IPVanish because for me is one of best VPNs in the world, it’s very easy to install and use and the price is really good! Guys, this is the only legal way available to watch Sherlock Holmes online. But there are other ways. Kodi is a free and open source media center that allows you to install add-ons to watch any type of media content available online. If you want to learn more about Kodi you should explore our website, we have lots of content about Kodi. There is many Kodi Addons where you can find all the Sherlock seasons and episodes. The most famous one is now Exodus. Type the following http://fusion.tvaddons.ag and then click in the Done button. Note: I have to warn that watching movies and series through these Kodi Addons is against copyright law. If you want to use Kodi to stream movies / series, for peace of mind I recommend you to use a VPN while you stream content on Kodi. I highly recommend IPVanish, with IPVanish your traffic will be anonymous, your ISP won’t be able to track your traffic, your IP will be masked and IPVanish don’t keep logs of your activity. This is a legal way to keep you safe. If you are outside UK, just looking to watch Sherlock Holmes Online, then I recommend you to use BBC iPlayer + IPVanish. BBC iPlayer is a great free service, it’s legal, you will get HD quality guaranteed and you can watch live channels. I’m from Canada, BBC iPlayer + IPVanish works like a charm for me! The best solution! Thanks!